Folk Music - Guitar Tab and Sheet Music, 10,000+ folk and traditional tunes and songs. 10,000+ folk and traditional tunes & songs. With Downloadable Sheet Music Scores, Tabs for guitar, mp3 audio, midi and PDF. The tunes/songs are accessed by clicking on a letter on the above nav-bar, A for songs beginning A etc. There are approximately 200 titles under each of the letters. This huge collection of 10,000+ tunes are mainly from Western Tradition music and mostly originating from the British Isles and other English speaking countrys. Each piece is provided with a sheet music score that includes tabs for guitar, some of the scores also have chords marked. Each tune has midi music you can play on-line or download the file You can also download a PDF version of the score & tabs suitable for high quality print out without the ads and banners shown on the web page. 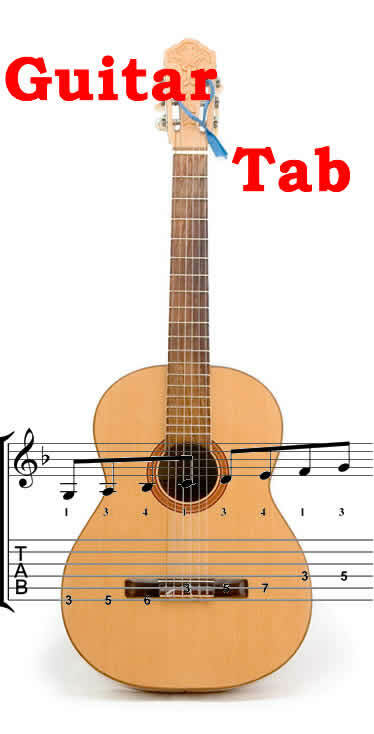 For the Guitar Tab, EADGBE (standard) tuning for the guitar is assumed. The tune versions here are not intended to represent any particular version or performance from any particular artist. Some of the tunes provided have more than one different version reflecting the "folk processing" that often occurs with such songs and tunes. These tunes are provided for none commercial personal academic and research purposes. These tunes were collected from various Internet sources and are believed to be in the traditional category, however, this can not be guaranteed and you should verify the copyright status of any piece before any commercial use. Note that we also have this same collection with TAB and sheet music for mandolin. Listen to the tune: Each tune is provided with a download link to a midi file so you can hear what the tune sounds like. PRINT OUT: Should you need a print-out of the song, PDF versions (without banners or adverts) are available to download from the link at the bottom of each song page.